Strongwell Corporation, world leader in the pultrusion of fiber reinforced polymers (FRP) and headquartered in Bristol, Virginia, was recently recognized by the Southwest Virginia Technology Council, winning the “Advanced Manufacturing of the Year” award for Strongwell’s overall achievements in advanced manufacturing in the southwest Virginia region. Strongwell is actively involved in numerous efforts to promote the advancement of manufacturing and manufacturing careers. Strongwell’s participations ranges from involvement in efforts such as the Institute for Advanced Manufacturing Innovation (IACMI), a multi-year $250 MM domestic public-private partnership to create product and employment growth in advanced composite manufacturing, to the ongoing promotion of science, technology, engineering and math (STEM) education. 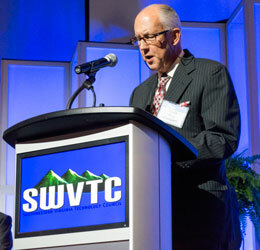 To learn more about the Southwest Virginia Technology Council, please visit http://www.swvtc.net/.